I can see this being my next purchase. Freeing up my system from the confines of my music room seems like a good way to go for me. picked up a stealth one a few weeks ago and loving it so far- my only real wish, and it seems to be a common one, is that they had made an option to have the 1U row in the middle of the case as opposed to the top. I personally have no use for the ins/outs and oftentimes REALLY wish the 1u modules were in the middle for easy patching, it can be awkward patching way up there and then back down. First I had Intellijel 84hp 7U case, which I really loved. Then as I got more modules I decided to swap if for 104hp version. Finally few weeks ago I swapped back to 84hp size, because somehow the dimensions work better for me - also it’s good to have limitations with the set-up. 104hp version got a bit overwhelming for me somehow. I don’t know if Intellijel manufactures other than 104hp version anymore though. They are great cases, if you plan to travel, you need to get the bag… you don’t want to take this anywhere without a protective layer. Ordered one last night (from good ol’ Cymru Beats ) after seeing all the positive //// comments. I’m looking forward to getting it setup! 3x84hp is what I have a the moment, and that was the limit I had reached before I think it would become a bit overwhelming for me. Slimming that down further to 2x104hp will be nice (+ I have the 1u rail that can replace a lot of the utility type stuff). Thanks for the tip on the bag. I’ll have a look (seem to remember it is quite spendy so I may have to hold off on that). Grau Modular is building cases with intellijel 1u middle rows these days, if that becomes a major issue. Not that I know of (I’m sure there are some out there), but it might not be that difficult to have one made. i did this with acrylic but am now toying around with the idea of aluminium. Even with the rails and power, it’ll def come out to be cheaper. If I understand it correctly, the handle on the Intellijel cases is rigid – it doesn’t fold down. Is this the… uh, case? If so, are no-one finding this cumbersomely stiff when carrying? Not to mention portruding and taking up space when using system flat down on a table? The hanle is not collapsable and quite stiff. Has not gotten in the way for me when using the system but isn’t the very comfortable to carry for moderate distances. A soft cloth wrap attached with velcro has served me well. Thanks. It’s seems so… don’t know if counter-intuitive is the right word, but… to make a good quality case (and so light!) and then fit it with an uncomfortable, unfoldable handle. Yeah I thought the handle would bother me a bit but I’ve taken it out twice now and the case is so light that the odd shape of the handle doesn’t really bother me when carrying it. I do think I’d get the gig bag if I was going to carry it outside with any chance of rain. This is pretty neat. You’d want to make sure you got your dimensions correct, measure twice as they say. Seems you could make a skiff/boat/tray and add some rails and end caps. Use a 1U usb tile plug in a dimable usb-light or power external equipment such as a BS Pro. Get the additional carrying bag. Great quality and the safest way to travel. Has anyone built a case with battery power? I have one of these on the way. It’s designed for jump starting car batteries. It also has 12V output and some USB charging stuff. I’ll post when it arrives. NLC Andrew posted a DIY case to Instagram, made of gutters. So, I have this plan to downsize from 460HP to somewhere in the 360HP range. It seems like a good opportunity to think about changing my case setup. 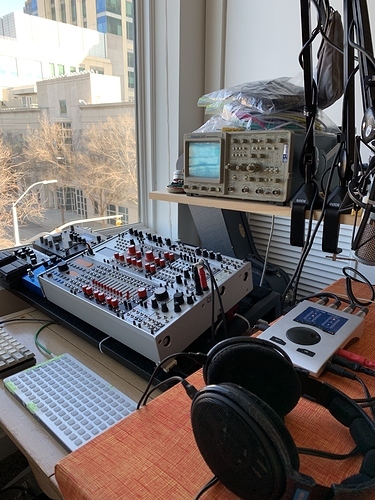 Right now, I have a corner desk with cases on either side and QWERTY/Maschine/LCD in the center, with a Doepfer Multicore connecting them. On the left is a desktop rack stand with 9U of Euro, a 1U power strip and 1U Focusrite audio interface, CV.OCD strapped to the top support rail, and a Microbrute in front. On the right, a Mantis with a shelf over it for pedals and small devices. It uses a lot of desk space. That rack stand is 15" deep, where 4 would be fine for the Euro gear, and the Mantis has to sit pretty far forward to not be too obscured by the shelf. The rack stand is not at all portable or sturdy. I tend to “patch locally” and minimize use of the Multicore, so some combinations of modules happen a lot more than others for arbitrary layout reasons. It has to fit on one side of my desk; 120HP might be too wide. Patching Euro to the audio interface, MIDI-CV converter, pedals and toys has to be non-awkward, and all those devices have to be easily acecssible. The 16n Faderbank has to be close to the Teletype/TXb/ER-301 to minimize i2c run length. For instance: I could replace my rack with a 6U/7U 84HP case, assuming I can fit the Focusrite in a sideways 2U rack case or put it underneath or something, and leave the right side as is. That case could be a RackBrute 6U (encouraging me to upgrade the Microbrute to a Minibrute 2), Intellijel, etc. So I could go with 12U 84HP or 9U 104HP for the left, and a lunchbox or Pod 60 for the right – that’s closer to my target size. But I don’t know what gets relegated to the right side with the pedal interface stuff, and it seems like a worse balance than my current split. Now that I have two cases (104hp 4u and 84hp 7u), I like the ability to keep them as separate instruments if I want to (which is a nice creatively stimulating exercise sometimes), but as a default in-the-studio-space config, it is really nice to have them close together. If the main issue is the amount of space it takes up, could you build up instead of out? Example w the oscilloscope as a 2nd tier. could you build up instead of out? While I’ll have to measure it in person when I get home, each side of the desk should give me about 24" wide x 23" deep to work with, and I’d estimate a 30" max in height would be comfortably within reach (lower if it’s something like a pedalboard shelf, as opposed to front panel controls on the Focusrite for instance). Based on those dimensions I think I could fit a Structure 360, MDLRCASE Studio, or two Intellijel 7U cases, etc. in there with room for the faderbank as well. Hmm. Naive question. Is it ok to connect 2 separate cases? I have acquired omsonic ouch and pixel dust, and there’s a bass drum module coming shortly that will be great too I’m sure! So I’m thinking of making a wee drum skiff. Would it be ok to connect triggers from my nerdseq in my main rack to a smaller one?